Whether you work from home every day or routinely find work following you home from the office, your home office ​can easily become one of the rooms in the house that you spend the most time in. Because of that, it's very important that the design of the room be engaging and energizing. That way, no matter how you feel about the work you have to do while you're there, the design of the space is helping to lift your spirits and propel you to success. There's any number of ways to create a space that inspires your creativity and drive. Colors, patterns, and art are all good places to start. Or if what you need is a quiet space to gather your thoughts and focus, your space can help you to do that too. A soothing, neutral color palette and minimalist furnishings will enhance your zen and optimize your workflow. Whatever your work style, there's a room that will help you to be your best. And to make sure you get it, here are some fabulous inspirational ideas for decorating your home office. The home office typically is not the largest room in the house. But that doesn't mean that you can't feel like you have all the room you need to stretch out. If a single wall is all you have for your office, give yourself a desk space that spans the entire wall. That way you'll never feel as if you're confined to only the area around your chair. If you don't have enough space available to give your home office an entire room to itself, you'll need to find ways to incorporate it into the decor of another room. One way to do that, while still giving the office area its own space and personality, is to define the area with paint. In this room, the entire office is painted black, while the rest of the room is a light gray. This helps the office to be separate while still providing a scene-stealing design element to the larger room. The quest for more storage at home is never limited to just the office. But it is one of the places where the question presents itself most pressingly. The good news is that not only is storage available for your office, but, with a little creativity you can make it into an eye-catching feature that will hold your files while giving your office a cool and stylish look. In this industrial-looking space, the home office has been given a cool, modern feel with a geometrically-designed shelving arrangement. The shelves are a perfect contrast to the vintage desk and mid-century chair. The mix of materials and eras helps add to the charm of the small office. Never underestimate the power of patterns. The right patterns, applied well, can bring life to just about any space no matter what shape or size. So if your home office is a bit on the small side, but you don't want to feel like your home has its own built-in cubicle, jazz things up a bit with a strong dose of pattern. Here, a short feature wall sporting a wallpaper in black and white diagonal stripes is all it takes for this petite home workspace to go to the next level. Even so, this space wisely refrains from letting the feature wall stand alone. Instead, smaller pops of pattern are woven throughout the space in the art and storage boxes. The additional patterned notes help to keep the interest going while giving context to the wall. Home offices are often shared spaces, so why not make room for everybody? Even having only a single wall to work with, this space offers room for two complete work stations with fetching wood grain-patterned chairs. The warm colors of the chairs stand out from the rest of the office - done mostly in shades of gray - to bring a bit of energy to this serene working space. This space takes the shared office space concept a step further with a work area designed with a stunning sense of symmetry. The identical chairs with their rose gold legs are a wonderfully colorful starting point to the twin work stations. Fitting storage, lighting, books and even art into the built-in console, this 1-wall office area is a testimony to the power of efficient and effective design. One of the most beautiful things about a home office is that it really can be whatever you want it to be. And if you love art, then there's nothing stopping you from turning your office into your very own personal art gallery. This space is a beautiful example of using the walls to turn an office into a space to inspire creativity and energize the mind. While maintaining a very peaceful and mediative feel, this space combines several colorful artworks into a gallery wall that spans two walls. This can also be a great solution if you've got a number of pieces of art that you haven't been able to work into the decor of your other rooms. Color is one of the most direct ways into impact your interior environment in ways that are sure to impact you in turn. The key is in finding the right balance between the colors you love in order to create the space that you need. Your home office might not need to be filled with the same bright colors as your living or family rooms, but it could still benefit from a single moment of color that will set the whole area off. This space is a study in home office design in a neutral color palette. 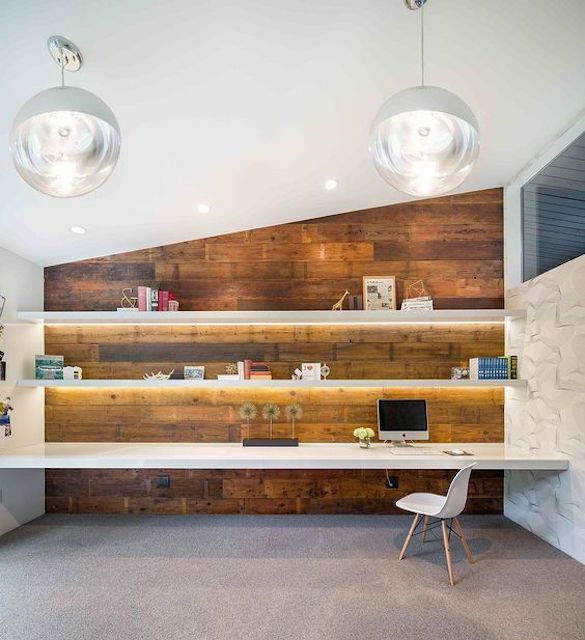 The cool walls and floors are complemented by warm wood tones in the desk, shelving and chairs. What brings it all together, however, is the bright pop of yellow that comes from the cabinet. Without overpowering the rest of the space, just a moment of this smile-inducing shade is enough to energize the entire room, transforming an otherwise ordinary home office. On the other hand, you can always go big with color, covering a feature wall or even an entire room in your favorite shade. This gorgeous, cool shade of blue is just about everything that this room needs. With it, the architecture of the wall becomes pattern, and the wall as a whole provides a canvas for the art to really pop. Another way to go about bringing color to your home office is to spread it around. Instead of relying on only one piece or one shade, try bringing in color from all corners, layering small pops to create a big visual impact. This space gets the balancing act just right, with colors spread throughout the room for an eclectic and engaging space to work in. One of the nicest and healthiest things that you can do for yourself in a home office is to give yourself a space with plenty of natural light. Even if you don't have the opportunity for wall length windows on all sides, your office space and your mood will only benefit from an influx of sunlight. Also, when break time rolls around, there's nothing better than taking a few minutes to daydream while you gaze out the window. If you need the room to yourself when you're working, but don't have the space to accommodate a separate home office, you can always think about making the separation yourself. This home office space carves out a space all its own with wraparound glass walls complete with door. It's an innovative solution to issues of space that many home offices run into.